Prakasananda is supposed to have lived some time towards the latter half of the sixteenth century. He must have been an elder contemporary of Appayya Dikshita, who lived in the sixteenth and seventeenth centuries and in whom we find the earliest mention of Prakasananda’s name1. Prakasananda’s chief work is the Vedanta-Siddhanta-Muktavali or Siddhanta-Muktavali, in which he propounds the doctrine of drishti-srishti. 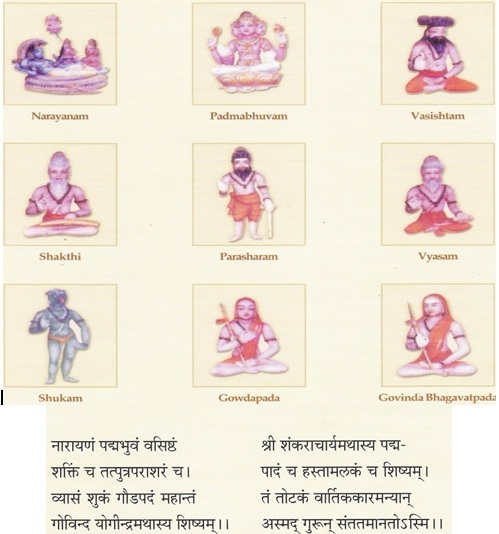 There is a commentary on this work by Nana Dikshita, called Siddhanta-Pradipika, written at a time when the different parts of India had been pervaded by at least the third generation of the followers of Prakasananda. In addition to the Siddhanta-Muktavali, Prakasananda wrote many other works, such as Tara-Bhakti-Tarangini, Manorama, Tantra-raja-Tika, Maha-Lakshmi-Paddhati, which show his attachment to the tantra forms of worship. Prakasananda’s distinction lies in propounding the doctrines known as drishti-srishti-vada in Advaita. As Brahman is unchangeable, the multifarious phenomena of the world-appearance have to be explained in terms of the changeable but indeterminable principle called maya. In the hands of the later followers of Sankara this principle gradually thickened into a positive stuff through the evolution or transformation of which all phenomena were to be explained. Critics of Advaita naturally began to charge Advaita with an apparent dualism: of the unchangeable Brahman and a changeable stuff called maya. And Advaita writers tried to explain that no dualism was involved in providing for the concept of maya; but they did this in such a way that the positive character of maya was never denied. Prakasananda for the first time tried an extreme solution to the problem posed by the critics. He denied the objective character of maya and explained the world-appearance from a purely sensationalistic point of view. The existence of objects is nothing more than their perception (drishti). There are no objects corresponding to our perceptions and existing independently of our minds. All phenomena are subjective or imagined; so that the jug that I see had no existence before I perceived it and it will also cease to be as soon as I cease to have the perception of it. It is the mind that creates its own objects. The traditional Advaita view is that the objects comprising the physical world exist outside our minds, though with reference to Brahman the world of objects as well as the world of minds are illusory. One reason cited for the objective existence of physical phenomena is this. The same objects which one perceives are perceived by others also. There is, therefore, a common world of objects existing independently of any one’s mind. The illusions of the pratibhasika order alone are individual. The snake seen on the rope exists for the perceiver only and not for others. On the contrary, objects of everyday life, that is of the vyavaharika order, such as tables and chairs, are common to all and therefore, objective or independent of individual minds. It is only for the jnani, for whom the individual mind is no longer a limitation, that these objects are illusory. The drishti-srishti-vadin, however, insists that even for the common man the world of everyday experience is an illusion. According to him the mere fact that the experience of objects is common to all is no argument to prove that the objects exist independently of their minds. For, even at the level of dreams and illusions within waking life there may be similarity of experience, but on this ground we do not argue that the things perceived are objective. Each of ten persons may mistake a rope for a snake and run away. But the similarity in their perceptions does not imply that there is a snake out there in space and time. We have no hesitation in saying that the so-called snake is just an idea in the mind of each person. In the same way, why cannot we admit that the table or the chair that each of us perceives is just an idea in the mind of each of us? Traditional Advaita holds that while pratibhasika objects are modifications of the perceiver’s own ajnana, vyavaharika objects are modifications of maya, which is the common basis of the ajnana of individuals. But the drishti-srishti-vadin denies any need to posit a common factor called maya. According to him the objects comprising the vyavaharika are, like the pratibhasika objects, modifications of the individual perceiver’s own ajnana, in so far as they too are illusory superimpositions on their real ground (Brahman). It might appear that the drishti-srishti-vadin takes up a position which is the same as the stand taken by the Vijnanavada Bauddha. But the identity is only apparent. There is a fundamental difference between the two. The drishti-srishti-vadin remains an Advaitin in spite of his special theory of perception. Though both of them reduce the world of objects to mental activity, while the Vijnanavadin regards the mental activity as itself the final reality, the drishti-srishti-vadin assumes a permanent unchangeable substrate for this activity, namely Brahman. Mental activities are modifications of ajnana, which has for its basis Brahman. But though Prakasananda was the first exponent of drishti-srishti-vada, the origin of the doctrine could be traced even to Mandanamisra of the ninth century2. Prakasananda seems to have derived inspiration from the Yoga-Vasishtha for his doctrine of the non-existence of things when not perceived (ajnata-sattvanabhyupagamatva)3. According to the Yoga-Vasishtha it is only ideas that have existence; there is no physical world apart from ideas. On the lines of the Yoga-Vasishtha Prakasananda says that all objects have only perceptual existence (pratitika-sattva). It is clear that in following the Yoga-Vasishtha in this regard Prakasananda makes a departure from the Advaita tradition handed down from Sankaracharya. While both Prakasananda and the Yoga-Vasishtha deny the existence of objects when not perceived, Sankaracharya not only admits their existence but also holds that they exist in the same form in which they are known. Sri Sankara’s views on the matter are clearly set forth in his commentary on Brahma-sutra, II.2.28. His refutation of the Buddhistic school of Vijnanavada in his commentary on the same sutra applies as well to Prakasananda’s drishti-srishti-vada. Moreover, Prakasananda fails to offer any positive proof in support of his thesis that the objects comprising the physical world have no existence apart from their perception. On the analogy of dreams and the illusions that occur in waking life he offers a hypothesis. Just as dreams and illusions are mere ideas without any real objects corresponding to them, the world of waking consciousness is a mere awareness (vijnana-matra or bhava-matra) and does not point to anything objective. Instead of presenting arguments in support of his hypothesis, he merely tries to show that there is no direct proof for the rival hypothesis, namely that objects exist apart from our awareness of them (pratiti). Prakasananda fails to appreciate the possibility of indirect proof for the independent existence of objects, for example, as given by Sri Sankara in his commentary on the sutra referred to earlier. In the light of these facts it is not surprising that, apart from his pupil Nana Dikshita, Prakasananda failed to attract any notable following and that the drishti-srishti school turned out to be just a temporary phase in the long history of Advaita. To make our account of the special features of Prakasananda’s philosophy more adequate let us note, though briefly, his views on some other topics in Advaita also. The cause of the world: Prakasananda is not prepared to concede even a provisional place for the concept of causality in the explanation of the world. He regards it as inconsistent with the fundamental position of Advaita. Brahman cannot be called the cause of the world, for causality implies the duality of cause and effect, but there is nothing other than Brahman. Nor can nescience (avidya) be called the cause of the world. For, but for avidya, we would not have the very notion of causality and how can we apply to avidya a category which is itself dependent on avidya? Hence the theory of cause and effect is outside the scope of Advaita. The relation of the world (jagat) to Brahman. In explaining this, traditional Advaita concedes a provisional place to parinama-vada and finally discards it in favour of vivarta-vada. But Prakasananda does not accept even vivarta-vada as the final explanation of the world. Since Brahman is the only reality and since the world–appearance is nothing but Brahman, there is no need to explain the appearance of the world, as though the world is different from Brahman. Prakasananda argues that in accordance with the texts of the Veda, maya, in terms of which the world is sought to be explained, is a fictitious non-entity (tuccha). Aspirants of middling intellect (balah) think of it as real and for them only vivarta-vada has any value. For talented aspirants the phenomenon of Brahman appearing differently (vivarta) simply does not exist. In taking such a stand Prakasananda has often to differ from Sarvajnatma Muni, Prakasatman and others, who developed a realistic conception of maya, namely as transforming itself into the world of diversity. It is thus seen that Prakasananda took an extreme position on most of the important points of Advaita. Naturally, therefore, his contribution failed to exert a permanent influence on the development of Advaita philosophy. But in judging the value of that special contribution we must go more by the intention behind it than by its result. It must not be forgotten that Prakasananda was as ardent about Advaita as any other Advaitin and that his exposition of Advaita did not compromise its fundamentals. In fact, it was his anxiety to save Advaita from a possible dualism as between Brahman and maya that led him to take up a position of extreme idealism. 1. S.N. Dasgupta, A History of Indian Philosophy, Vol II, p. 17. 3. Ibid., pp. 17, 270. 4. Quoted: Ibid., p. 224.